Star Wars: The Force Awakens is finally available on Digital HD, with the Blu-ray and DVD arriving on April 5. This home video release will include the full-length documentary Secrets of the Force Awakens: A Cinematic Journey, which goes behind-the-scenes of this box office blockbuster. Yahoo! 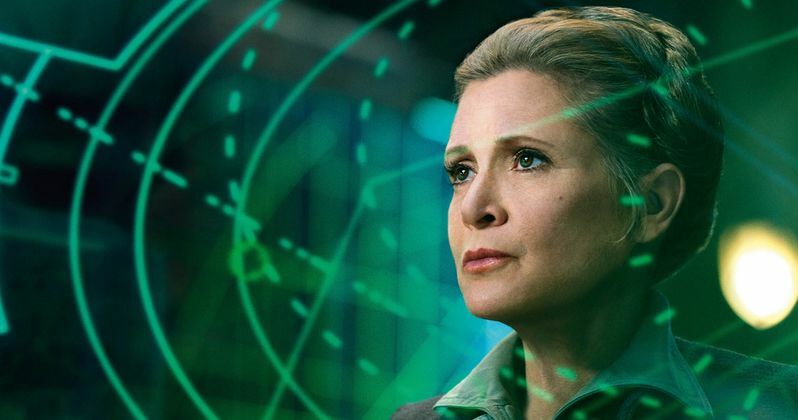 Movies reports that part of this documentary features Carrie Fisher, who reveals that her first day on the set was the worst in her professional career. Here's what the actress had to say below, about how she messed up her lines in a scene at Resistance headquarters. "I'm the custodian of Princess Leia, so it's my job to kind of protect her. It's my whole life, so I was very nervous. The first day I had was this massive scene. I was scared that I would make mistakes, and I made mistakes. It was basically the worst day I ever had on a film set in my life. It ended, and I got to go to sleep and come in another day, and it was better." Discover the complete story behind the making of Star Wars: The Force Awakens with in-depth documentary and bonus material that will take fans on an exciting journey behind the scenes. Secrets will be revealed through extensive footage, never-before-seen deleted scenes, and exclusive interviews with the actors and filmmakers. The bonus features kick off with Secrets of The Force Awakens: A Cinematic Journey. For the first time, discover the complete story behind the making of The Force Awakens, revealed through in-depth footage and exclusive interviews with the actors and filmmakers in this feature documentary. Here's what J.J. Abrams had to say about the actress' first day. "She hadn't acted in a while, and I think she was nervous going into this," he recounts. "Once we started to do it, she seemed to fall into it very easily. To bring a character to life that you hadn't played in 30-some years ... I understand for all of them how daunting that could be." Star Wars: The Force Awakens was directed by J.J. Abrams and written by Lawrence Kasdan & J.J. Abrams and Michael Arndt. Lucasfilm president and eight-time Academy Award nominee Kathleen Kennedy and J.J. Abrams, along with his longtime producing partner Bryan Burk, are the film's producers. Having established a musical legacy with his iconic scores for the previous six films in the Star Wars Saga, acclaimed composer John Williams returned to score Star Wars: The Force Awakens, ultimately garnering his 50th Oscar nomination for it. Stay tuned for more on Star Wars: The Force Awakens as we get closer to the Blu-ray and DVD release.